Having married my best friend and soul mate this year (4 months ago to be exact!) 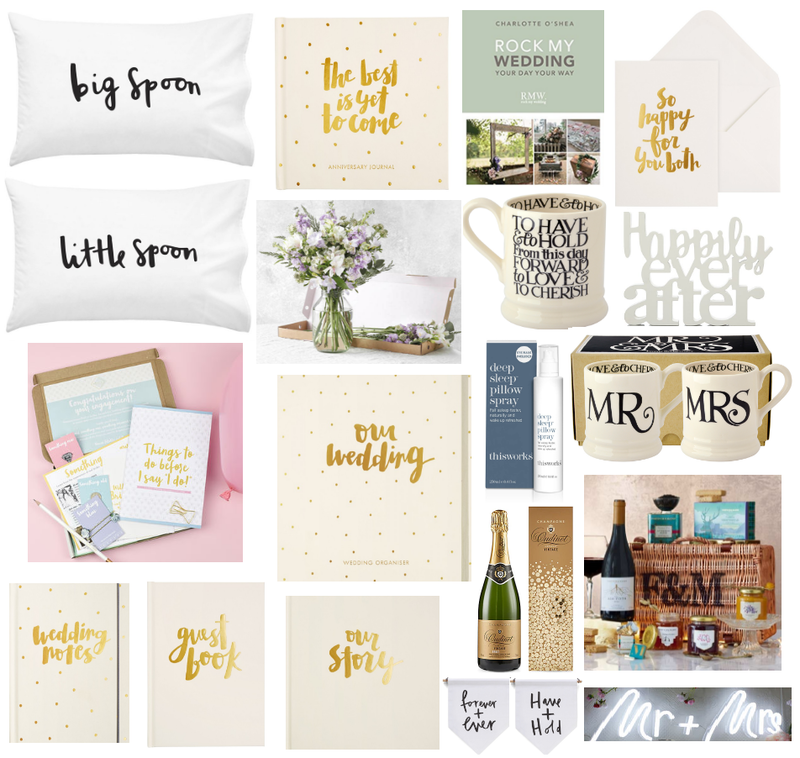 and having had the excitement of lots of my friends announcing their engagements this year, I thought I'd do a different sort of gift guide this time around. For someone's first Christmas together as husband and wife, it's the best time to embrace the wedding and find everything Mr & Mrs under the sun (or Mr Right & Mrs Always Right if you wish to be a bit more tongue in cheek!) Personalised gifts work well too with Mr & Mrs [...] out there loud and proud in the form of personalised bath robes, towels, stationary and so on. I never thought I could get so excited about towels, but I love our fluffy white personalised ones! Hampers are also a lovely idea for a couple celebrating their first Christmas together as man and wife. My word of advice would be to avoid any photo frames or photo albums - I learnt that this is one of the most commonly received wedding gifts! Being engaged is a wonderful, warm, fuzzy feeling and whilst researching wedding ideas on Pinterest is great fun, organising a wedding is stressful and a lot of work. Particularly when you only give yourself 6 months to plan the wedding.. (it seemed like a good idea at the time...). Some of the most useful gifts we were given were books and planners which break the planning process down into manageable chunks and help with all the boring stuff like budget and finances (yawn). Pampering goodies are a life saver for those sleepless nights where your mind is excitable and unwilling to switch off! And whether engaged or married, champagne and flowers always go down well. Flower letterbox subscriptions are a lovely idea. How wonderful would it be to receive fresh flowers every month in the post? I can personally vouch for the gold typeface stationary set from Kikki K (what I used for wedding planning! ), the Rock My Wedding book (contains the dreamiest of pictures!) and the This Works pillow mist. The latter one of my bridesmaids bought for me right before my wedding and it worked MIRACLES. Hope this gift guide comes in useful!